Did they have ginger flavor? That's my favorite, but so hard to find. I'm so glad you reviewed Mochilato, its like my new favorite place right now. I actually think their shaved ice is pretty yummy and I'm pretty sure its their most popular item, maybe you should ask for it without condensed milk next time so it won't be too sweet and overpowering. You can actually ask and pick which fruits you'd prefer and the ingredients you don't want. Their "single size" is seriously NOT single though... its pretty funny to see like 5-6 people struggling to finish their "family size." Of course, their mochilatos are the highlight... the 'Peaches and Cream,' 'Cookies and Cream,' and 'Pistachio' are some of my favorites. Try their Monaka next time, its like a red bean sandwich with your choice of gelato inside. I think they went over the top with the condensed milk (and the beans!) the rest of it looked good though. That Pinkie Mochi looked adorable! I'll have to hit that, soon! Thanks. I think Mikawaya is trying to compete with Bubbies for the mochi ice cream crown. Mikawaya may have invented it, but Bubbies has a seemingly endless array of flavors. Awesome. I think I'm gonna be in that area today. Your shaved ice sorta reminds me of a custom smoothie I had a while back. I asked for nearly EVERY fruit they had. My smoothie ended up looking kinda gray and tasted like water with lots of seeds, haha. That's a good question. I bet they do! I'll have to check the next time I go. I think I will custom make my shaved ice next time for sure. All it needs is probably just the sweet bean, mochi, and some condensed milk (which I like actually). I'm glad that these shops are opening up. Now if we can get a Cafe Blanc to open here in Irvine, that'd be somethin'! Yeah, I think if I had just kept the condensed milk and the beans away from the mixture I would've been alright. Maybe the green tea too. Definitely that rose syrup. It had no business being there when the condensed milk was there. Now I'm curious. Where is there a Bubbies?! Yup. Italian or the Japanese, but not together. That was my mistake in ordering the Mochilato Way. I have an "after" picture of the slush that was left. But I held back on showing it 'cuz it ain't pretty. Cool! I'm glad. If you know of any leads on new places, do let me know! 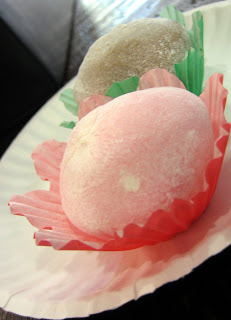 I absolutely love the Mikawaya mochi ice cream (they have them at Trader Joe's too). Are the ones they serve at Mochilato the same size as what you get in the box at the store? I can't say I'm loving the looks of the pic, but I'm not a sweet person. I do love what they did with the interior and space, but that's not enough to keep a place going. I believe a bought a coffee adn that was it! Sounds like it was a good choice! Like your writing much better here than in the weekly. Media difference? Yep. Same size. But I'm still unsure if they make them at the store or somewhere in a central factory. I wouldn't order that shaved ice again to be sure. Their store is definitely gorgeous. But you're right, the fact that it wasn't busy during the hottest day of the year (that was when I went), isn't a good sign. I do like their mochi ice creams, except that it could bankrupt me if I liked them too much. Interesting. You're not the first to tell me so. My editors were the first. Yet I cannot figure out the reason for the discrepancy. I type on the same keyboard and I'm using the same brain. Lately, I've been loosening it up for the Weekly articles and getting comfy, where early on, I think I was just trying too hard. Be sure to check out this week's Weekly -- It's the Best Of Issue. And hopefully a lot of my stuff will be on there. That top picture looks like vomit. But the mochi looks tasty. I dont' have to try it. I already like it. 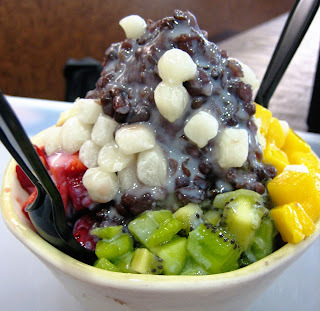 Fresh fruits, chewy mochi bits, lots of red beans, green tea power, with condensed milk....to me, that's a winning combination. Thanks for the great find. The "everything but the kitchen sink" thing looks kinda grotesque, even though I personally have trouble deciding which toppings to put in my shaved ice. My standard combo is mochi/almond tofu/peanuts or azuki beans. With condensed milk, of course. LOL! Well, I was hoping it didn't come to the the "V" word, but I must admit, it does doesn't it! You are a brave and adventurous soul! My tastebuds, on the other hand, are easily overwhelmed. Wimpy, I'd call 'em. Now you're talkin'. Those toppings you mention would be great! Actually, substitute the almond tofu for custard and I think that's a halo-halo! We ate there just the other night. I agree about the mishmash of flavors in the Mochilato Way (we had to try it), but it's by far the best value. It's either $4 for a thimble-full of gelato, or $6 for this gargantuan bowl of everything. By the way, we saw the folks there popping mochilatos out of the box and into the display case. ;-) That says to me that it's best to stick to the flavors you can't find across the street at Trader Joe's or a nearby 99 Ranch. I just went to Mochilato, I bought frozen yogurt. I suggest this, it's better than Pinkberry. Mochilato is delicious. Try their coffee-flavored shaved ice complete with coffee gelato and coffee mochi chunks. I agree with a previous commenter - Irvine has been opening so many dessert stores! Mochilato, Yogurtland, Pinkberry, Kiwiberri, and all of those bubble tea stores. Wowww. That's a good tip. Why bother buying a commonly stocked flavor at Mochilato if it's sold at 99 Ranch. Besides the wierder the flavor, the better!. I'm so over Pinkberry. And I haven't even tried it. Pinkberry PR backlash. Irvine is my favorite city. Good thing I live here! Thanks for sharing this review about Mochilato..hhhmm.. I think they're place are good and clean.. I love Mochi so, I will be there one of these days..